The rise in the world population, climate change effects, and urbanization are examples of the challenges the world is facing today. With the ever-rising competition for resources, Agro-industry field of study is undeniably a crucial part of the growth and wealth of the world’s economy. 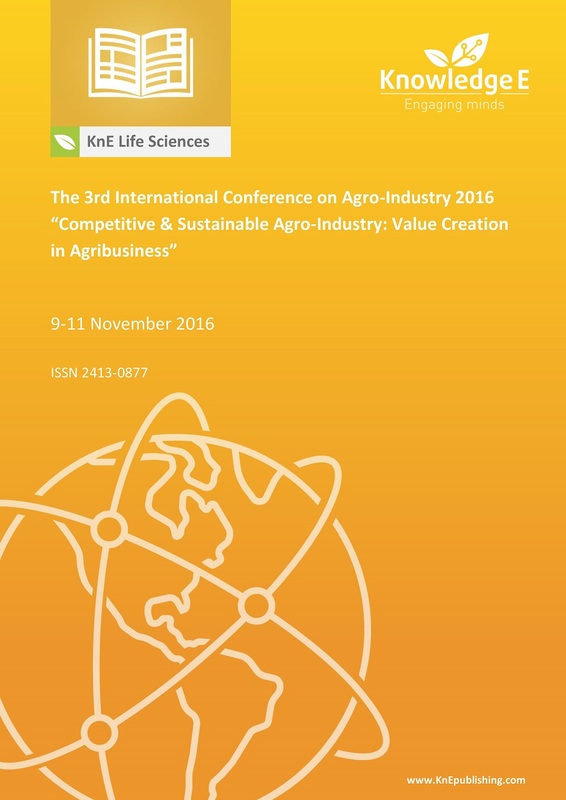 The 3rd International Conference on Agro-Industry 2016 embraced the 'Value Creation in Agribusiness' theme and was a platform to share and discuss the advancement in Agro-Industry Science and Technology, Business Management, and the knowledge of Supply Chain and Logistics Management among researchers, scientists, students, practitioners, and participants in public and private sectors from Indonesia, Japan, Taiwan, and Thailand. Indexing: The 3rd ICOA 2016 Conference Proceedings are indexed in Web of Science (by Clarivate Analytics, formerly Thomson Reuters and ISI) as of 26 November 2018. Nafis Khuriyati,	Didik Purwadi,	Ibnu Wahid F.A.,	Kartika Fitriani,	I Putu Eldwin I.D.